Los Angeles area gambling czar Mickey Cohen, a frequent target of Mafia assassination attempts, was shot as he left a Sunset Strip eatery in the wee hours of July 20, 1949. Three companions, including a state agent assigned to guard Cohen, also were wounded in the attack. Cohen, then thirty-five, his thirty-eight-year-old aide Edward "Neddie" Herbert, twenty-six-year-old actress Dee David and state agent Harry Cooper emerged from Sherry's Restaurant, 9039 Sunset Boulevard, just before 4 o'clock in the morning and approached Cohen's black Cadillac. Shotguns erupted from across the street. Cohen inexplicably crouched just as the guns went off and, as a result, was the least wounded of the group. He took a slug to the right shoulder. Edward Herbert, a recent addition to Cohen's gang and the scarred survivor of another recent gangland attack, was struck by several slugs. His spinal cord was damaged, and he was instantly paralyzed from the midsection down. He lingered near death for about a week, as doctors tried surgery and blood transfusions. He died of his wounds and complications on Thursday morning, July 28. Dee David was wounded in her back. She was treated at Citizens Emergency Hospital. She recovered quickly. Two large-caliber slugs struck Harry Cooper in the abdomen. Cooper had recently been assigned - somewhat curiously - by state Attorney General Frederick Howser to serve as a bodyguard for Cohen. As Howser made that appointment, he also urged city and county law enforcement agencies to steer clear of Cohen. Cooper was rushed to Hollywood Receiving Hospital. His condition was critical for some time, but the agent eventually recovered. The gunmen were well positioned for their escape. They lurked behind tall grass and brush on an old abandoned building foundation. A stairway behind the foundation led downhill into the backyard of 9035 Harratt Street. After firing into Cohen and his companions, the gunmen fled down the stairway, through the Harratt Street home's yard and down a residential driveway. They climbed into a waiting automobile and sped away. Cohen had been often in the news since the June 20, 1947, Beverly Hills murder of his friend and underworld associate Benjamin "Bugsy" Siegel. Authorities believed that Cohen controlled gambling throughout southern California following Siegel's killing. In the summer of 1948, Cohen survived an assassination attempt. The following March, seven Cohen gangsters were arrested fleeing from the scene of the brutal beating of Alfred Pearson. When certain police officials ordered that the gangsters not be charged and that records relating to their arrest be destroyed, a grand jury investigation was launched. The investigation exposed Cohen connections to law enforcement and resulted in conspiracy indictments against Cohen, a number of Cohen henchmen, three police officers, an attorney and a local businessman. Trial was originally scheduled for June 27, 1949, but later postponed to October. In May 1949, police determined that another attempt had been made on Cohen's life. The gang boss's car was reportedly brought to a local garage with bullet holes in its body and blood staining its interior. Los Angeles Mayor Fletcher Bowron was bothered by reports of corruption in the police department. On July 15, 1949, less than a week before the shooting at Sherry's Restaurant, Bowron went to the radio airwaves to promise the citizens of Los Angeles that graft would be exposed. "I want to know what police officers have received favors from Mickey Cohen or his mob and all matters relating to bookie operations within the city," the mayor stated. "I want to know if there are any possible connections between police officers and organized crime in any way at all..."
Attorney General Howser's assignment of agent Cooper to guard Cohen came to light just one day before the shooting. Cohen recovered from his wound while under heavy police guard at the Queen of Angels Hospital. Though he told investigators he had no idea who was responsible for the shooting, there was reason to believe he was lying. Some in the hospital overheard a Cohen telephone conversation on July 23. Cohen, obviously angry, said into the phone, "I know who did it. They've crippled me for life. Can't use my right arm. But I'll take care of them in my own way. The investigators keep coming up, keep asking me who did it. That's the end. I can handle this and I will handle it." The Los Angeles Times reported on the conversation in its July 24 issue. The authorities questioned Cohen about it that day. But he denied the conversation occurred at all and insisted he did not know who the gunmen were. The police identified three suspects and brought them in for questioning. Joseph E. Messina, a former barber who was believed involved in gambling, was interrogated and released. Tony Brancato, a Kansas City mobster who relocated to southern California, was taken into custody on July 24 on a charge of suspicion of attempted murder. A Brancato associate, Anthony Trombino, surrendered to authorities on July 25. Brancato and Trombino were released on the twenty-seventh. Cohen checked himself out of the hospital against his doctor's orders on July 29, in order to attend the funeral services for Edward Herbert. Following the services at Willen Mortuary on Santa Monica Boulevard, Herbert's remains were transported by plane to New York City for burial. Cohen intended to fly to New York and even made plane reservations but changed his mind at the last minute and went to his home. He later told the press, "It would cause too much commotion. It wouldn't do any good to go East now." Cohen reportedly paid $1,500 in hospital bills for himself, Edward Herbert and Dee David and several thousand dollars for Herbert's copper coffin. Detectives seemed to be on the right track as they connected the shooting at Sherry's Restaurant with underworld gambling rivalries, particularly the long rivalry between Cohen and the Dragna Mafia clan of Los Angeles. Near the end of July, Ignatius "Jack" Dragna was questioned. Dragna admitted knowing Cohen and also admitted attempting to compete with Cohen's organization in a horse-race wire service racket some years earlier. But Dragna claimed he long ago gave up on that racket and knew nothing about the shooting. Several decades later, Mafia turncoat Aladena "Jimmy the Weasel" Fratianno revealed what he knew of the incident. According to Fratianno, Mafia boss Jack Dragna was obsessed with the idea of killing Cohen and enormously frustrated with Cohen's series of lucky escapes. Fratianno said Dragna ordered Dominic "Jimmy Regace" Brooklier and Arthur "Army" DiMaria to ambush Cohen outside Sherry's. Their getaway car, according to Fratianno, was driven by Simone Scozzari. None of those individuals were charged in connection with the shooting that killed Edward Herbert and wounded Cohen, Cooper and David. Dragna died in February 1956. 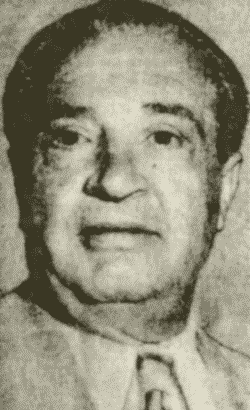 The next year, Simone Scozzari was one of the Mafiosi noted at the Apalachin, New York, Mafia convention. Scozzari rose to the position of underboss of the Los Angeles Mafia. He was deported to Italy in 1962. DiMaria reportedly remained a soldier in the crime family. He died in 1972, nine years before being publicly accused of murder by Fratianno. 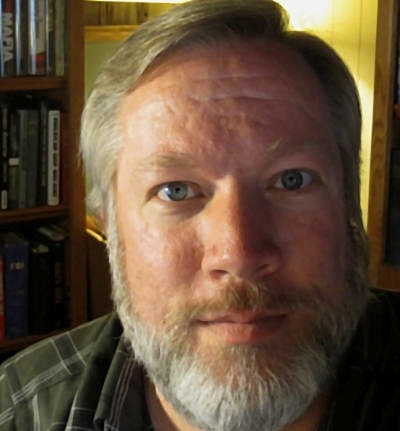 Brooklier was a recent addition to the crime family at the time of the Cohen shooting, and his assignment as a gunman was intended to test his mettle. His botching of the Cohen hit did not prevent him from rising within the organization. Brooklier became boss of the crime family in the mid-1970s. His poor handling of the organization and hostility toward Fratianno helped convince Fratianno to cooperate with the FBI. Brooklier died in federal custody in 1984. 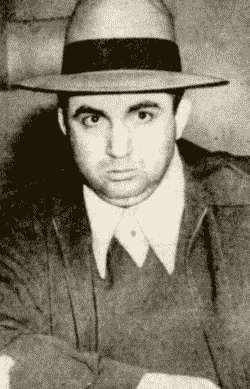 Mickey Cohen, Dragna's longtime nemesis and longtime target, died of natural causes in the summer of 1976. "Jury investigating Cohen case summons four more witnesses," Los Angeles Times, March 31, 1949, p. 1. "Bowron asks grand jury action in police scandal," Los Angeles Times, March 23, 1949, p. 1. "Mickey Cohen jailed, officers get suspensions," San Bernardino County CA Sun, March 23, 1949, p. 1. "Mickey Cohen to appear at grand jury's inquiry," Los Angeles Times, March 24, 1949, p. 1. "Two Mickey Cohen pals arrested in Phoenix home," Los Angeles Times, March 25, 1949, p. 1. "Attorney halted booking of Cohen gang, jury told," Los Angeles Times, March 26, 1949, p. 1. 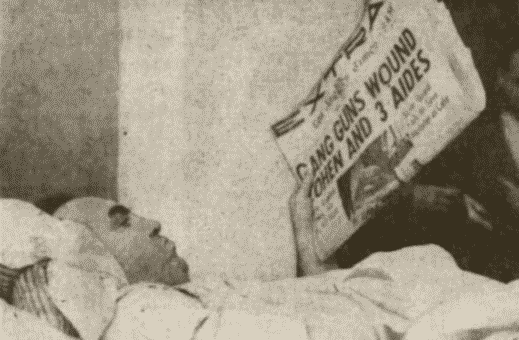 "Mickey Cohen, three police officers and nine others indicted in conspiracy," Los Angeles Times, April 13, 1949, p. 1. "Last two Cohen men surrender in beating case," Los Angeles Times, April 19, 1949, p. 23. "Cohen and 12 others to go on trial June 27," Los Angeles Times, May 17, 1949, p. 2. "New search starts for Allen records," Los Angeles Times, June 6, 1949, p. 1. "Court postpones Mickey Cohen and henchmen's trial," Los Angeles Times, June 25, 1949, p. 6. "Bowron vows all-out inquiry of police graft," Los Angeles Times, July 16, 1949, p. 2. "Howser assigns officer to protect Mickey Cohen," Los Angeles Times, July 20, 1949, p. 1. "Gang guns wound Cohen and 3 aides," Los Angeles Times, July 20, 1949, p. 1. "Circumstances aid escape of gunmen," Los Angeles Times, July 21, 1949, p. 6. "Mickey Cohen, henchmen blasted in gang warfare," Santa Rosa CA Press Democrat, July 21, 1949, p. 1. "Cohen lets it slip, he knows assailants," Los Angeles Times, July 24, 1949, p. 1. "Angry Cohen refuses to tell who shot him," Los Angeles Times, July 25, 1949, p. 1. "Control of race information seen as Cohen attack motive," Los Angeles Times, July 26, 1949, p. 1. "Sheriff acts to bar gangs from strip," Los Angeles Times, July 28, 1949, p. 1. "Cohen fails to fly east as planned," Los Angeles Times, July 30, 1949, p. 1. "Former Cohen rival quizzed in shooting," Los Angeles Times, July 31, 1949, p. 1. "Explosion near home upsets Mickey Cohen," Los Angeles Times, Aug. 3, 1949, p. 2. Demaris, Ovid, The Last Mafioso: The Treacherous World of Jimmy Fratianno, New York: Times Books, 1981, 36-37. Feather, Bill, "Los Angeles membership chart 1920-50's," Mafia Membership Charts, Nov. 7, 2017. Murphy, Kim, "The godfather's son," Los Angeles Times Magazine, Sept. 17, 1989, p. 14. 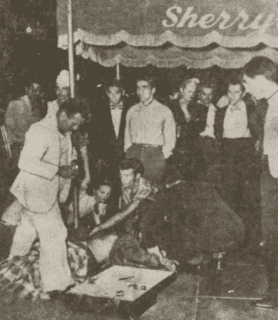 On this date in 1941, informant Abe "Kid Twist" Reles fell to his death at the Half Moon Hotel, Coney Island. 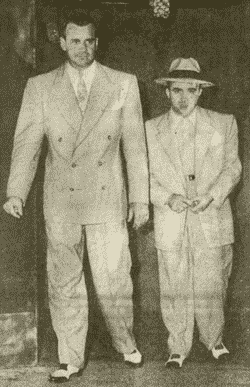 The thirty-five-year-old Reles, who had been cooperating with authorities in Murder, Inc., prosecutions since early in 1940, was expected to testify shortly against big shot Louis "Lepke" Buchalter. Earlier court appearances had been in murder cases against Harry "Happy" Maione, Frank "the Dasher" Abbandando, Martin "Buggsy" Goldstein and Harry "Pittsburgh Phil" Strauss. Reles also aided California authorities in obtaining indictments against Benjamin "Bugsy" Siegel and Frank "Pug" Carbo for the November 1939 Hollywood murder of Harry "Big Greenie" Greenberg. While Buchalter was on trial (along with Louis Capone and Emanuel "Mendy" Weiss for the September 1936 murder of Joseph Rosen), Reles was housed on the sixth floor of the Half Moon along with government witnesses Sholom Bernstein, Max Rubin and Al Tannenbaum. According to the official story, Reles decided at about 7 a.m. to try to escape from government custody rather than testify. Authorities said he exited his sixth-floor window and used a rope of tied-together bedsheets to lower himself to the window below. The rope was fastened to a radiator pipe using a length of electrical cord. It reportedly was not fastened very well, and detectives said it detached as Reles attempted to open the screen and window on the fifth floor. Reles's body was later discovered on an extension roof about 42 feet below his last estimated location. Noting that the body came to rest a good distance from the hotel wall, some investigators and journalists quickly decided that Reles had been thrown out of his hotel room window. Reles became known as the underworld canary who could "sing" but could not fly. New York Post, Nov. 12, 1941. New York Times, Nov. 13, 1941. Los Angeles Times, Nov. 13, 1941.